Light your braai or heat your grill to medium-high heat. Remove leaves from the rosemary twigs except for the tips. 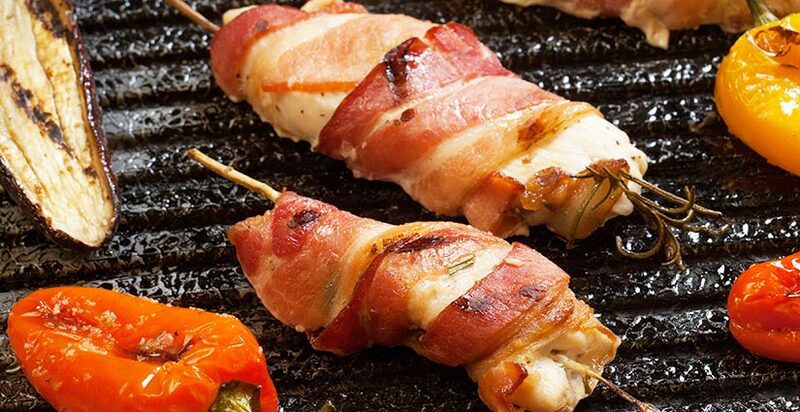 Wrap each strip of chicken with a slice of Garfunkels Streaky Bacon. Skewer each bacon-wrapped chicken strip onto a rosemary twig, making sure to weave the twig through both the bacon and the chicken to secure. In a small bowl, whisk together the tomato sauce, honey, mustard and black pepper. Place the skewers on your braai or grill and cook one side for about 3 minutes or until bacon starts to crispen. Turn over and baste the grilled side with half of the sauce while the other side cooks. After about 3 minutes, turn the skewers back over and baste the other sides. Continue to ip and baste until the bacon is caramelised and crispy and the chicken is cooked all the way through. Remove from the braai and enjoy with grilled vegetables, salad and baked potatoes.